Everyone Can Learn . . .
People often mistakenly believe that only those with innate talent can learn the violin. This is not true. The ingredients necessary to learn a musical instrument are a commitment to daily practice and listening, a supportive environment, and an effective teacher. With these elements in place, anyone who desires can learn to play an instrument. While children can begin learning the violin at a young age, it is never too late to start. In addition to the Suzuki Method, my teaching approach is influenced by the pedagogy of Ivan Galamian, Shirley Givens, Paul Rolland, Simon Fischer, and Mimi Zweig. I am fascinated with the science of how we learn, and I love discovering new ways to break down problems for my students into small, easily managed bites. What I Teach . . . The great joy of learning music is in being able to share it with others! My goal in teaching is to equip students with the tools to express themselves free of limitations and enjoy a lifetime of music making. I teach to a high standard at all levels, and I believe that even beginners can learn to play with a beautiful tone, healthy posture, and a solid sense of rhythm and pitch. Phrasing — Musical equivalent of sentences. Dynamics — Expressive control of volume. Rhythm & Meter — A strong internal sense of rhythm and pulse; musical prosody. Ensemble Skills — The ability to listen to and play with other musicians. Healthy Posture — Relaxed and balanced bow hold, violin hold, and left hand position. Efficient Motions — Playing with a feeling of comfort and ease. Bow Control & Tone Production — The means to produce a beautiful sound and a variety of tone colors and articulations. Ear training develops an aural awareness of tone, pitch, intonation, and rhythm. While people often refer to themselves as “tone deaf,” true tone deafness (amusia) is a neurological condition which is quite rare. For most people, the ability to hear fine differences in pitch is a skill that can be developed. Music theory leads to a broader understanding of how music works. Music reading skills are incorporated in lessons from the beginning. Foundation skills include reading pitch and rhythm; understanding keys and scales; and analyzing musical form. In lessons, students develop new skills. To make those new skills become easy and habitual, students need not only to practice daily, but to practice effectively. Therefore, I believe it is vital to teach my students how to practice successfully and efficiently at home. 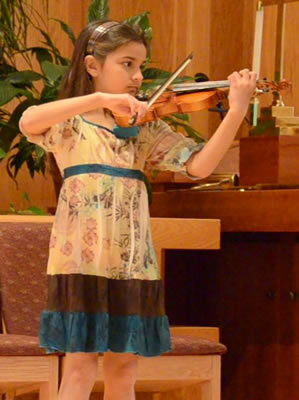 Students have the opportunity to perform in three solo recitals every year — two informal and one formal. Recitals are a wonderful way for students to experience the joy of sharing their musical achievements with friends and family. I teach performance and ensemble skills throughout the year to ensure that students approach performances feeling comfortable, well prepared, and ready for a fun musical experience.